I watched a coyote stroll through the park in front of our Toronto house early this Sunday morning. Really, it was more of an easy trot than a stroll, but it was certainly in no great hurry; seemed perfectly comfortable and at ease in this city park by the beach. 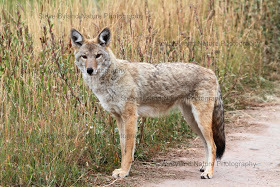 This is the coywolf, or eastern coyote (or just coyote), big cousin to the more common western coyote. First identified in the early 1920s in the southern part of Algonquin Park, this "new" hybrid of the western coyote and the eastern wolf (now extirpated in the area), with a bit of domestic dog DNA thrown into the mix, the wily and adaptable eastern coyote has been extremely successful, and in recent years has started moving into the cities of Southern Ontario, where it can make a good living from the plentiful small mammals in ravine parks (as well as the odd domestic cat or small dog). So, if you see a scruffy wolf-like large dog in a Toronto park or even on the city streets at night - grey/brown, with erect ears and a bushy, often black tipped tail - it's probably a coywolf, or eastern coyote. Keep Tiddles out of sight, and please don't feed it; just let it go about its business.